They are calling it "mixed-use", which is encouraging. However talk about getting "500 cars on site" makes me think that this will be another in the endless chain of South Willow strip malls. I'll still likely avoid S. Willow like the plague. In uplifting news, they finally had the grand opening for the new bridge over the Piscataquog River this Monday. Apartments are going in between Riverwalk Place condos and The Ball Stadium on the East side. I can see it from my window of my shop. That old OPAS building is no more and a new one is going up. A new building (unknown to me) on Queen City Ave is going up. And the Sundial Center is being proposed to have new luxury apartments or condos put up there once the school leaves I believe. The thread...lives! Thanks MonopolyBag for doing your best Dr. Frankenstein impression. There are a few new developments and repurposings of old/underused properties in the city proper. Here's an article about the Riverwalk apartments and the proposed Sundial Center apartments. Also of note is the proposal by Bill Binnie's group to turn the Citizen's Bank building on Elm & Hanover into a mixed use building with 91 apartment units. Construction at Giorgio's on Granite continues. The design is...questionable. The Hoitt Furniture building on Valley & Wilson will be turned into a drug rehab resource center housing a few different organizations. Any idea what's going up on the old OPUS location? The Riverwalk and Sundial apartments are exciting additions to the city--they're not right downtown, but should bring some more energy to the Rivers Edge area of town and might help tie it to downtown. The conversion of the Citizens Bank building into retail and housing is very exciting. There will be 16,865 square feet of retail space on the first floor (which seems unusually large for downtown, and could possibly attract an anchor-type tenant) with 91 apartments on floors 2-10. Here's a packet that the developers submitted to the City. I wrote in 2013 on LivableMT about the MHRA's plan to build housing for people with mental health issues at the OPUS location, so I'm assuming that that's what is finally being built there. While I laud the goal of building that kind of housing in a walkable area, it is extremely unfortunate that one of the oldest buildings in Granite Square was demolished when there's an empty lot immediately adjacent to it. In other interesting news, the NH chapter of the American Institute of Architects just announced the winners of their annual competition for young designers. 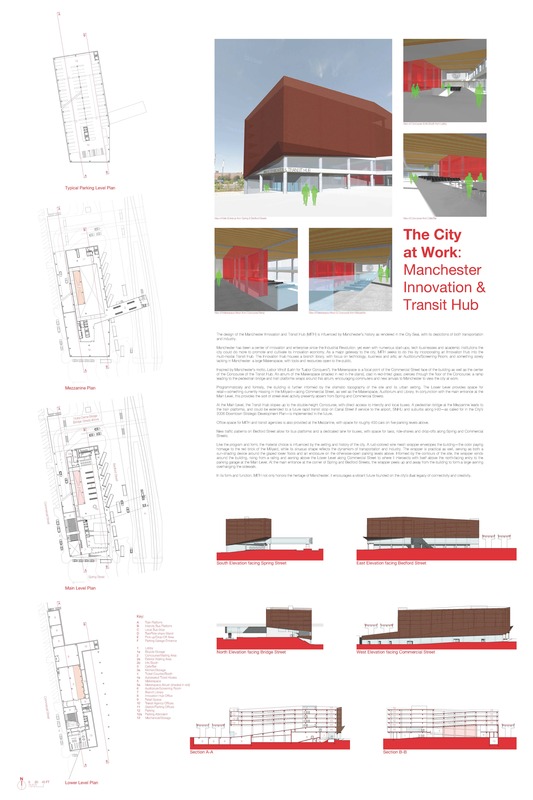 This year's competition was the design of an intermodal transit center on the Bedford Street lot site, with the requirement that designers come up with a complimentary secondary program. While mine was not one of the winners, I really enjoyed working on my submission to this competition, and am proud of the program (an innovation center with a public makerspace) and design I came up with. LivableMHT has been dormant most of the past year as I've been very busy and haven't been getting to Manchester as often as I used to, but I'm hoping to get permission from AIANH to post all of the entries on LivableMHT. The "big forehead" is a little bit reminiscent of the transit center in Greenfield at the new Vermonter stop. Could either look really nice or really clunky depending on how they mind their execution. It's a very good disguise if that's the parking level, however. Full canopy for the commuter rail platforms are definite no-go. The freight clearances on the NH Main are 17 ft.; the coal cars headed for Bow power plant won't clear it. Has to be the standard-issue 1-per-platform shelter that doesn't overhang the yellow line. But that's extremely minor fine print. Official NHDOT extension plan also concedes that Manchester has to be a pair of retractable edge mini-high side platforms and not full-highs since there's no room between the street grid for a third freight passing track. Entire length of the NH Main--Boston to Concord--has the protected wide-load clearance exemption. Looks like the plaza rendering affords tons of width by bleeding into the regular sidewalks; that's exactly what you want to see for managing crowds on a slightly less efficient low platform. Solar panels: that whole block is an excellent all-day sun spot, so ideal place to go hog-wild coating every surface with panels. Should really do up the "forehead" with them too, as it would give the whole complex excellent chance of full energy independence during the daytime. Has anyone heard any recent news on the possibility of there being a commuter train coming to Manchester? I know it has become a real political tool in local/state elections. Study was released this Fall. Anybody's guess what's going to come of it given NH politics' wild mood swings, but right now momentum is highest it's ever been. What remains to be seen is whether they swing the full build to Manchester or the minimal build that just pokes to the state line as a City of Nashua 'go-it-alone' effort. Ball's entirely with the state on that one. City of Nashua has already purchased the Crown St. property for the downtown station, which it wants to develop into a multi-modal transit center. Will be built across from the freight yard on a turnout with full-high platform. They are still scouting properties in South Nashua near the state line. Original preferred site from several years ago was the demolished industrial property at the Spit Brook Rd. dead-end. Pheasant Lane Mall was initially reluctant to have it near their property, but since then has warmed up considerably to the idea...so other sites may be opening up downwind from Spit Brook. NHDOT and MassDOT are collaborating on completing the missing southbound leg of Exit 36, tied to the Exit 1 frontage road; don't know if construction fully funded, but it's final-designed. That may inform which of the 2 exits has the station entrance at the end. They want large parking capacity and a bus depot since this is the major catchment for the highway and area retail, and keeps the traffic away from the downtown walkup station. Full-high platform on turnout preferable because this stop will draw big crowds, but that depends on final site selection and how closely the site pinches along the river. Airport and downtown Manchester are the only other stops planned. Think Airport's going west of the river right underneath the connector road overpass where there's lots of parking room available. #2 site would be I-293 Exit 2, but that's much more constrained so definite non-preferred. Either way, takes a shuttle bus to get down the street because it doesn't get *quite* close enough to do a one-stop T.F. Green-like superstation. If I had to bet, Town of Merrimack is going to be screaming for an infill to plug the long gap between Nashua and the airport. They were initially omitted for the 1980 launch of Concord commuter rail...but made such an impassioned plea they got an infill stop barebones-paved and added within weeks. Chances are history repeats itself with them inserting selves into planning process or securing an I.O.U. for infill at first opportunity. Layover yard would be Manchester freight yard if it goes there, Nashua freight yard if either South Nashua or Downtown gets done on the minimal build. Nashua's a somewhat busy yard with onsite security and plenty of unused space to carve out. Manchester is virtually deserted with massive amounts of space, but would be more expensive to equip. As for why they aren't doing Concord now: signal system ends in Manchester, track past Manchester is truly awful 10 MPH. They need to sit and digest Phase I first, because Manchester-Concord with just 2 stops in Hooksett + Concord will cost at least as much as state line to Manchester with 3 stops given how extensive the track rebuild has to be on the north end. Since this so far is just NHDOT's study, there's been no reciprocal planning action from the T yet on what their infill stops would be. North Chelmsford was studied previously and would almost certainly go on the board if Nashua does. Walking distance to Vinal Square, behind 2 auto junkyards on Butterfield and Sleeper Streets. Adequate room for full-high + a passing track. Advantages of a somewhat dense square and existing LRTA buses serving the square. Chelmsford residents already slam the Lowell garage, so would be an immediate above-average performer as a station. Probably somewhere between Wilmington and West Medford on daily boardings. For revenue purposes I can't see them passing it up. 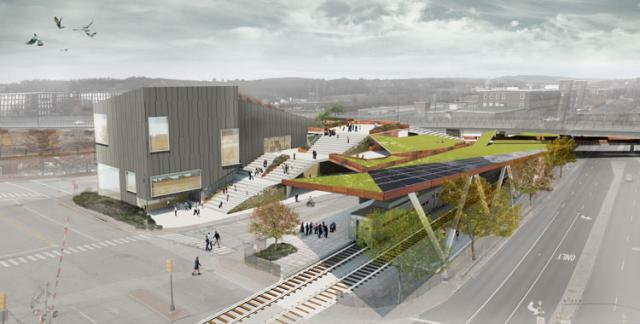 UMass-Lowell may push hard for an infill at its pre-existing overpass. Might be tall order initially because lots of reconfiguration of the freight tracks needed before they can build it; needs a 2-track turnout + island platform with 2 freight passing tracks because of the big congestion on this stretch. However, that track work doesn't have to be done to full completion in order to get to Nashua in the first place. So UMass may need to wait a couple years longer for follow-on work. They can speed things up if the school chucks in a generous funding chunk. No need for a Tyngsboro stop. Sparsely populated where the ex-B&M stop used to be underneath the Tyngsboro Bridge, and increased LRTA service gets them to N. Chelmsford/Vinal Square or state line in a few minutes flat. I guess if demand exceeds all expectations they *could* be an infill candidate a dozen-plus years down the road, but I doubt it. Track is Class 3, 60 MPH passenger between Lowell station and Nashua Yard. A very rough-riding 60 MPH, though, so a thorough resurfacing is badly needed. They'll want to make it >70 MPH consistent with the rest of the Wilmington-north Lowell Line. Signal system from Wilmington to Manchester is a 1979 install, up to modern spec and compatible with the northside's pending PTC installation. Probably needs some SGR work replacing end-of-life components, but overall much better shape than the more limited and rapidly failing south-of-Wilmington signals. If it's Manchester, all 6 miles of single-track territory from N. Chelmsford Jct. to the border will need to be doubled-up. If it's just Nashua, single with passing sidings and empty track berth graded for easy later drop-in is fully adequate. Only 1 public grade crossing in MA: Welleman Ave., Chelmsford. A few private crossings: Wotton St., Chelmsford (possible closure candidate); 2 gravel private driveways along 3A in Chelmsford; River Rd., Tyngsboro (driveway to cluster of houses), 1 farm tractor crossing, Tyngsboro. Should keep grade crossing renewal costs minimal. Freight junction around Lowell station is due to be thoroughly reconfigured to eliminate freight-on-passenger schedule conflicts. Designed, but waiting for other bigger freight-related projects statewide to finish up. Work will prepare dispatch for sending passenger trains past the Lowell platforms without running into an immediate freight traffic jam. The 3 miles of freight mainline from Lowell station west to North Chelmsford Junction will get a lot of work done on overhead and undergrade bridges + track rehab in approx. 5-7 years when they start improving clearances through downtown Lowell for double-stack heavyweight freights to Portland. Has to wait until the Priority #1 clearance project on the Patriot Corridor to Ayer completes in 3+ years; after that Ayer-Haverhill is MassDOT's next-highest ROI statewide freight priority. This will put sizeable down payment on track rehab and clear away 1/3 of the work to the border on mostly non-MBTA money. Most of the T expenses would be isolated to the 6 miles from N. Chelmsford Jct. to state line, and any station construction therein. Having an answer from NHDOT sooner on probability of passenger extension also helps their case a lot for the feds on getting freight grants to jump-start this work. Substantial increases in Lowell service available if they get to NH. Lowell is the only line on the system except for tiny Stoughton that doesn't have any layover yard. Very limited storage, and they have to waste a lot of empty trips back to Boston. You could easily even out the mid-afternoon headways to half-hourly with this; Lowell is one of the few lines that'll generate good demand on an off-peak. Layover-related service increases should result in substantial ridership increases at all the existing stops, so the extension pays back more handsomely in farebox recovery than nearly all others. Basically, it's a light enough hit to the T's budget with enough low-hanging upside that if NHDOT is a-go they would probably greenlight it despite their debt situation. Will still be a few years because NHDOT is far from settled, but it's a project they can move quicker on than most others. If they played it right and got the freight money to pick up some of the tab, this could be done for a cut-rate $60-$85M depending on whether they have to add Massachusetts capacity for Manchester or just South Nashua. Yup, the deisgn looks like it belongs in Disney World! It is right down the street from my aquarium store, I drive by it every day at least twice. I hate it! I agree that the architecture looks like something out of Disney. Don't understand how this was seen as fitting in with the city's downtown plan. I would rather have a 4 story mixed development brick type building there with the restaurant on the first floor.